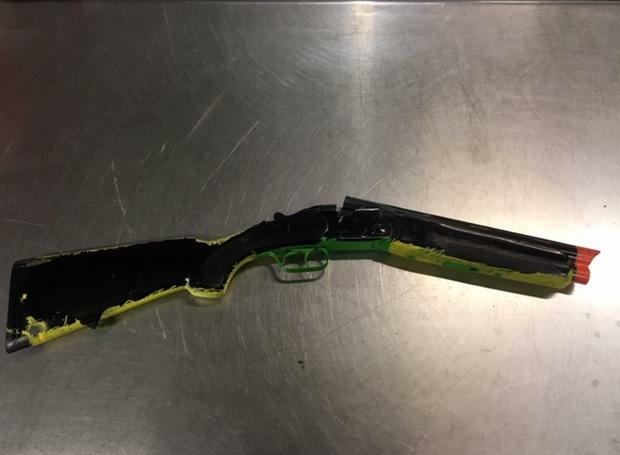 Tue., Feb. 5, 2019, 6:12 p.m.
Police caught a felon painting a shotgun to look like a toy in a Spokane motel room Monday, according to Spokane Police Department in a news release. The suspect, Elijah B. Zon, also was in possession of three black-powder guns, methamphetamine, heroin and ammunition. He was arrested and booked into the Spokane County Jail. Zon was wanted on an outstanding warrant for possession of a firearm, and police acting on a tip learned he had a weapon, according to the news release. Police entered the room he was renting, at Motel 6 on South Rustle Street, according to the news release. They found Zon in the middle of painting a double-barreled, sawed-off shotgun green and yellow with an orange tip to resemble a toy, according to the news release. Pictures display a shotgun painted on one side. “Officers throughout Spokane County and across the nation come across real guns that are made to look like replicas,” the news release stated. Zon is facing four charges of unlawful possession of a firearm, one charge of unlawful firearm due to barrel length and two charges of possessing a controlled substance. Published: Feb. 5, 2019, 6:12 p.m.